The Barrow-Downs Discussion Forum - Should I read the books before I see the movies? Should I read the books before I see the movies? Ok, after I saw the movie, I immadiatly dove into the books, but I lost intrest in the Fellowship, and went straight into the trials of Sam and Frodo. Do you think that was a bad idea? Cause now I'm lost! I read the end of the ROTK again, and I am totally clueless! Should I wait for the movie and be surprized, or should I bite the bullet and read it? I must confess, the only character I enjoy reading about, is Frodo. So, call me pathetic, cause I am! And doesn't he look sweet in this pic??? But, seriously, what do you guys say to my question??? Of course you should read the books! The movie, while amazing, is nothing compared to them. And you're going to continue to be very lost until you read FotR and TTT. I agree with Aldagrim with the don't skip anything part. When I read LotR I would occasionally skip bits, when I was tired [img]smilies/rolleyes.gif[/img], but I'd always go back and read them because otherwise you don't know where you are or who some people are e.t.c. Put it this way, if it wasn't important to the story Tolkien wouldn't have written it down!!! Enjoy!!! If you see the movies first, then you won't know what to expect, which would fun. But if you read the books first, #1 the movies will make more sense #2 you'll have a mental picture of some of the new characters, which you won't get after seeing the movie, because then you'll picture the Actors as the characters. 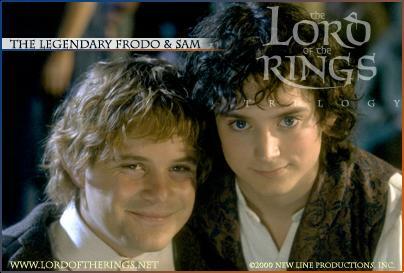 And that is a great picture of Frodo, one of the few I've seen of him smiling. I would say that you should read the book first, that way you will be surprised by the book. The movie will make more sence if you read the books first. I know how you feel though, I wanted to skip to the part about Frodo and Sam too, but don't. Now I like both parts. You are right though, he does look sweet in that pick! I don't blame you for just wanting to read about him. Maybe think of it this way, to understand him better, you have to understand his friends. To do that you have to READ the BOOK! Well, I read all of The FOTR, but when I got into the others I got bored with Aragorn and Mery and Pippin, and so on and so forth, so I went and read Sam and Frodo instead. As someone has said before (I don't remember who it was anymore), the movies are just fan-fiction. If you want the real thing, you have to read the books. The book is always better than the movie--no matter what book it is. LotR is no exception. The books cover much more than the movie and are well worth reading first. Read the books and dont skip anything, I saw FOTR and then i decided to read FOTR but I got bored and went to TTT but I got too confused and had to go back and read FOTR. They dont do everything in the movies so I had to keep asking my friend questions. Yes Frodo does look sweet. Sure i luv LOTR!!!!! They are the best books ever written, and Frodo is the best character ever written. I suggest you read the books first. The movie doesn't include all that is in the book, and so you might get confused. yeah I agree with most of the people on here, read the books first. Becuase I was like you, and I saw the movie first, and I had no idea what was going on, I didn't even know what a hobbit was!! but once I started reading the books it was all explained to me and there were a bunch of good characters that they didn't include in the movie. Anorien the BW must have edited your first post. It's cool that you like the Frodo bits but in my honest opinion I prefer all the bits with the rest of the fellowship. Either way if you don't read it all you'll end up hopelessly confused and it just won't hold the same depth and magic that it normally would.